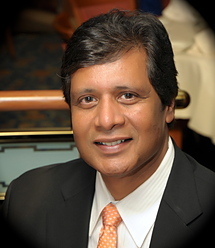 Hi, I am S Murthy Badiga, an interventional gastroenterologist in McAllen, Texas. Dr. S Murthy Badiga is a board certified gastroenterologist practicing in McAllen/Edinburg, Texas. He has extensive interventional gastroenterology experience. He received specialized training in advanced therapeutic endoscopy. He is an expert in treating digestive disorders including colorectal cancer, GERD, peptic ulcer disease, ulcerative colitis, Crohn's disease, gall stones, jaundice, hepatitis, liver cirrhosis, GI bleeding, swallowing difficulty, weight loss, pancreatitis and pancreatic cancer. Activities: Published papers on pancreatic stents. Activities: Published several articles and a book chapter. Technology, music, investing, reading and travel.